Maybe I am not the best blogger on the planet. I realize now that the time and effort that my favorite bloggers put in to maintain an awesome, content-laden page is enormous, and I have great respect for them doing and sharing with everyone, on top of taking the time to make amazing creations. 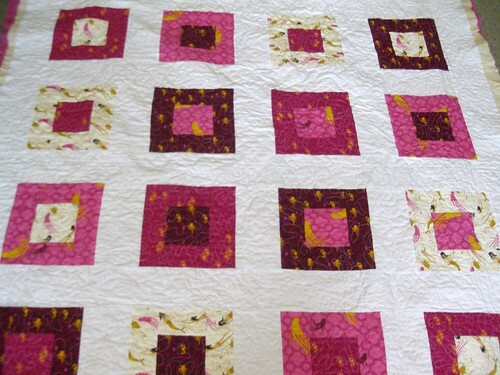 That said, I did want to share the quilt I made for Christine, I really think its my best quilt yet. 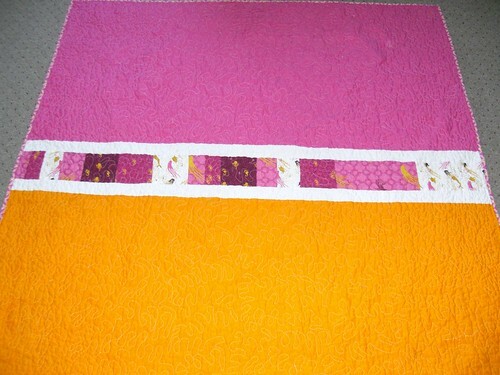 Its my 5th quilt. I finished it on May 21. Its my first time free motion quilting! That was an adventure. In the first 1/4 of the quilting, I think I ripped out as many stitches as I sewed. It was incredibly frustrating, but then…it just kindof clicked and I was able to finish it and be happy about the results. Yes, if you look closely you can totally see that the stitches are all uneven lengths, and I did “cross the streams” a few times and overlapped my stippling, but all in all I think it looks great for my first time. The quilt was a little smaller than twin size. I improvised most of the design based on crazymomquilt’s flea market fancy quilt top, I used fewer blocks, and a smaller size block. I like the top but I think I love the back of my quilt. I think its really visually striking, and so bright and really makes me happy. It hurt a little to give this one away, but the thanks I got from the recipient really made up for it! the quilt top, for whatever reason I never got a pic of it on the finished quilt. the label. 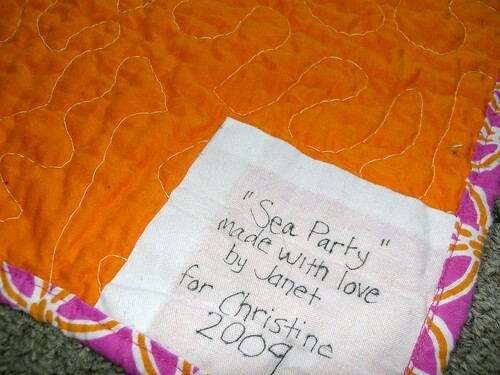 i always label my quilts! also, check out the binding, i made it myself! Awesome job! 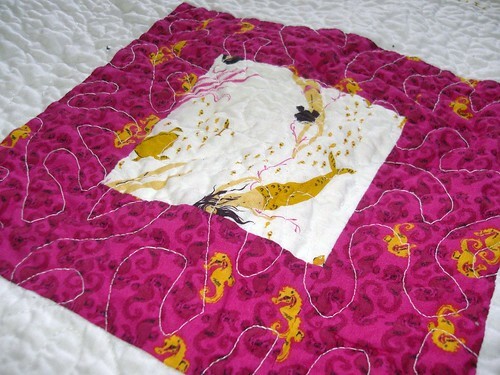 I love it– and good free motion quilting, too!